At Greenhouse Fabrics we are constantly looking for new ways to showcase our beautiful fabrics and to experience the luxury of our own products. 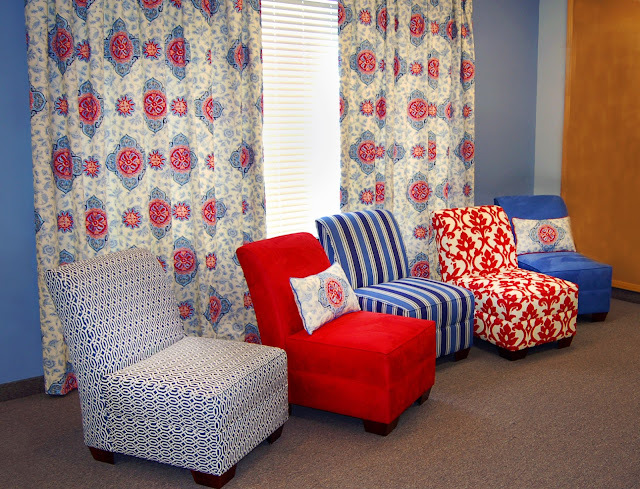 We decided to add a punch of color to update our conference room and product development center with new drapery and upholstered parsons occasional chairs. This room is where we meet with vendors, brain storm and hash out ideas, and bring the latest and best fabrics to our GH customers. To begin our GH update, we selected a stunning fabric from our Eclectic Elements Two, book B46, and custom ordered a set of floor to ceiling pinch pleated draperies made to frame the picture window and add a “WOW” factor to the room. The fabric was a perfect blend with the periwinkle wall color, showcasing a large scale ribbon-edged blue and red medallion. Next we had five parsons occasional chairs upholstered to coordinate and blend with our cornflower blue and garnet red color scheme. We knew we wanted durability combined with a fashion forward approach; therefore, we chose two of our best suede solids, one from our Fashion Suede book 957 and the other from our Superior Suede’s book B92. We combined these with three gorgeous woven patterns. One pattern from our Color trilogy 1, book C08, has a blue and white geometric chain link design, the second from our Greenhouse Gallery II, book B92, is a handsome indigo and cream stripe, and lastly a striking updated red and white printed outdoor damask fabric from our New Showroom Fabrics collection available on-line. What a great mix! For these and other terrific Greenhouse Fabrics visit us at Greenhousefabrics.com or call your Customer and Fabric specialist and they will be happy to assist you with all your fabric needs.